Acción Democrática Secretary Gral (Henry Ramos Allup) uses party’s website for libel. Some folks are calling it a triumph of politics. Others are singing the praises of a politico whose greatest achievement, to date, is to have outmaneuvered a bunch of green, hapless politicians that are totally unaccountable to their constituents. And yet others are just fawning. In Venezuela’s absolutely destitute and desperate society, even people who should know better are happily spreading the HenryPonlesunParao hashtag. Though Ramos Allup did not mention it explicitly, every one knew he was referring to me. Why would Ramos Allup write that I was allegedly wanted for drug trafficking, etc.? What was the basis, where was the evidence? 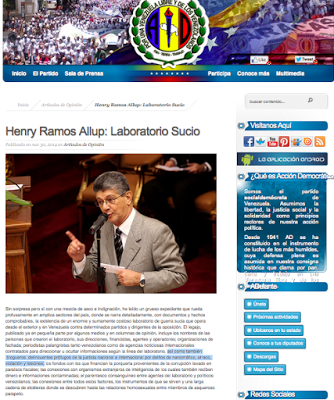 Ramos Allup had been fed highly defamatory, and totally spurious, claims about me. The source of those claims, which Ramos Allup presumably had no reason to question, was his own family. For it has to be said and repeated, loud and clear, that Henry Ramos Allup, newly elected president of Venezuela’s Congress, is the brother in law of Francisco D’Agostino, one of the Associates at Derwick. Henry Ramos Allup is married to Diana D’Agostino, Francisco’s sister. The patriarch of the D’Agostino family is Franco: one of the most corrupt contractors of the period now known in Venezuela as “la cuarta republica”, i.e. the 40 years that preceded Hugo Chavez’s election. I challenged Ramos Allup to show evidence of his claims, and I am -still- waiting for a reply. Ramos Allup loves to claim that his use and command of the Spanish language is “impeccable”, and yet, he wrote a libellous piece that does not contain a single shred of verifiable evidence, admitting that it was based on an anonymous report that he had received in an unmarked envelope. So here we have, the incoming Chair of Venezuela’s Congress attacking innocent people on the basis of anonymous reports received from unknown sources. In his utter chutzpah, Ramos Allup even claimed that he knows what has gone on with media acquisitions in Venezuela (first exposed here, and here), going as far as saying that those selling may have problems explaining source of funds when trying to get them out of Venezuela. He even mentions a Portuguese bank where Derwick has stashed some of its ill gotten money. Surely, he must have issued similar warnings over the years to his brother in law and father in law, right? Is this the kind of politico that will get the new Congress to put a stop to rampant corruption in Venezuela? I shall wear as a badge of honour that both outgoing Chair of Congress #narcodiosdado and incoming Chair #DerwickRamosAllup have blocked me on Twitter, for in my view corruption has no political colour, it’s like human rights and it admits only one stance: for or against. UPDATE 12 Jan 2016: An interesting development took place in the last few days. Incoming Congress Chair, #DerwickRamosAllup gave an interview to fellow investigative journalist Cesar Batiz, claiming that I was responsible in involving him in the Derwick Associates corruption scandal, adding that he has nothing to do with it; that he is not responsible for what his brother in law (Derwick’s Francisco D’Agostino) does; and that his father in law (Franco D’Agostino) has not been contracted by the Venezuelan State since Jaime Lusinchi’s presidency (1984–1989). I have been researching and writing about corruption since 2002: first in vcrisis.com, then in blogger.com, Semana (Colombia), El País (Spain), La Prensa (Panama), Tax Justice Network, etc. The last site I launched, infodio.com, was banned by the Venezuelan regime. You can follow me on Twitter and Medium.